Memories of Miss Josephine Gilstrap and Winthorpe House in the 1930's. Rev. David Yabbacome - Induction and Installation - 20th April 2013. Herbert Walter Langford was born Werner Lampel on Feb 20th 1919, the son of a cantor at the Liberal Jewish Synagogue in Leipzig and was educated at König Albert Gymnasium, where his last three years coincided with the rise of Nazism. Because of his Jewish religion young Werner found himself isolated and mercilessly bullied. In 1937 he applied for a place at Berlin University only to be told, on a grubby postcard sent by the secretary of the Nazi Student Union, that they did not want Jews. Realising that there was no future for him in Germany, his parents, through the influence of some distinguished English people, obtained for him a ‘work permit' from the British Home Office. Leaving Germany, he landed at Croydon Airport in March 1939, knowing no one, and with nothing but two suitcases and less than £1 in cash. "I was completely alone in a new country, itself under the severe stain of preparation for war." he recalled, "but I was free as never before." Following the advice of posters displayed all over London, Werner volunteered for National Service and enlisted with 600 others, in the Auxiliary Military Pioneer Corps under the command of the 2nd Marquess of Reading (himself of Jewish ancestry). Although, they had German passports prominently marked with a red rubber-stamped ‘J' (for Jew), lawyers devised a special definition for them: ‘Technically enemy alien, of loyal disposition to HM The King.' Werner took his first oath of allegiance in German, his mother tongue. He spent four years in the Pioneers but hankered after more active service and eventually joined the Royal Navy as one of 50 ‘Writers Special.' He had by then, on the advice of the army authorities, changed his name to Herbert Walter Langford. Short, plump, bespectacled and red-faced, Herbert Langford looked the most unwarlike-looking sailor in the Fleet, but he proved to be brilliant at his job, which was to listen on a special RT set and monitor German communications between aircraft and ships. He joined the destroyer HMS Westminster, escorting east coast convoys, and then, in 1944, the destroyer HMS Wanderer, escorting cross-Channel convoys on and after D-Day (6thJune 1944). On two occasions Herbert's warnings enabled convoys to evade bombing attacks. He should have been mentioned in dispatches but all that batch of HMS Wanderer's recom­mendations was inexplicably turned down by the Admiralty. Though life on the lower deck was crowded and uncomfortable, Herbert Langford loved it and said it proved invaluable training for his later work among Durham and Northumberland miners. He was very popular and much respected in HMS Wandererwhose sailors called him ‘Duke' because of his ‘BBC' accent. They sewed on his buttons for him and did his dhobeying (washing clothes). In return he composed love-letters to their girlfriends and claimed he was resposible for several marriages. Herbert Walter Langford became a British citizen in 1946, this time taking the oath in English. In that same year he married Molly Hughes, from Bangor in Northern Ireland. Molly had left Belfast University and moved to London and worked for the publisher's, Longmans, as a Personal Assistant to one of their senior officials. Molly, a strong practicing Anglican, was one of the people who were instrumental in converting Herbert to the Christian faith. This turned out to be a happy marriage with three sons, Roger, William and Trevor. Herbert Langford then went to London University on a generous ex-serviceman's grant and took a first-class honours degree in History. Multilingual, he could read Latin, Greek, Hebrew, German, French, as well as English. Having found a vocation for Holy Orders, Herbert prepared for ordination at Wells Theological college. His first curacy was at Blaydon-on-Tyne, and he worked in northern parishes, mining villages and towns for 12 years. In 1963 he became Vice-Principal of St Chad's College, at the University of Durham. There he taught in the Department of Theology for six years - his many considerable talents, and his formidable scholastic ability was put to good use. It was the highlight of his life. This was followed by two years as Registrar and Examinations Secretary of Theological Examinations at Church House, Westminster. In October 1971, he was appointed Rector of the parishes of Winthorpe, Langford and Holme, near Newark, Nottinghamshire. Whilst Rev. 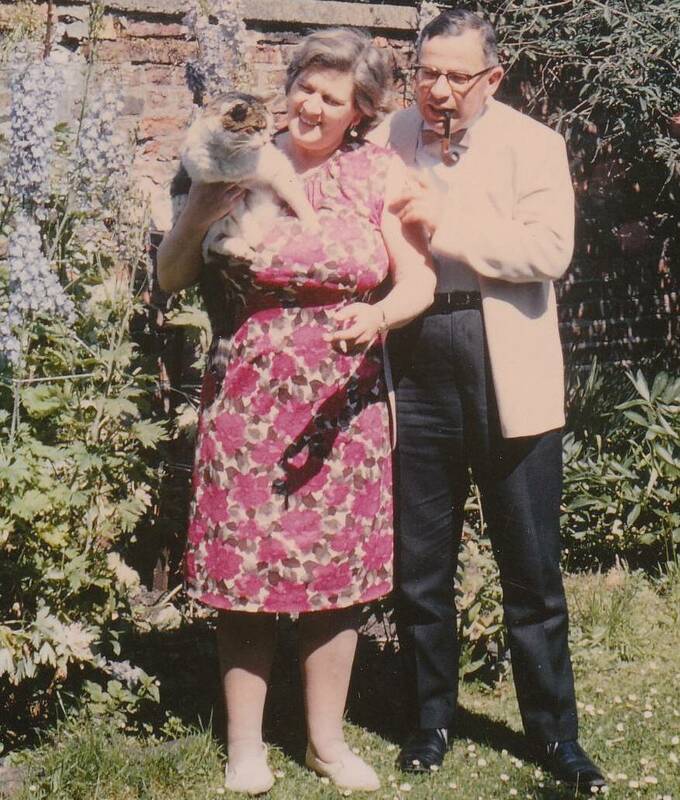 Herbert Langford carried out his pastoral duties, he was ably assisted by Molly, a first-class Vicar's wife. Molly was deeply involved in the Winthorpe village life, being a member of the Mother's Union, Women's Institute, Newark Music Club and Newark Civic Trust. Molly died suddenly of a heart attack on the 10th July 1983, whilst she and Herbert were visiting her relatives in Northern Ireland. Her ashes were interred with her parents at Bangor. After serving the community for 17 years Rev. Herbert Langford retired in 1988 and went back to Durham University which he said, "It was like coming home." He was unable to return to his old house as it had now become available for student accommodation. So he went to live in the small village of Pity Me, 4 miles north of Durham. He carried on his academic life, enjoying the company of the senior common room, where he was always the centre of humorous conversation. Rev. Herbert Walter Langford died on Sunday, 26thJuly 1992 in hospital in Taunton, Somerset, after a road accident, aged 73 years. His ashes were interred with Molly in Northern Ireland. To mark the high regard Durham University had of their former Vice-Principle of St. Chad's College, they decided to call his former home ‘Langford House.' His family was highly honoured. December 1980 - Rev. Herbert Langford's letter for the first issue of Focal Point, a monthly magazine for the villages of Winthorpe, Langford and Holme. In your busy lives, preparing for Christmas, do not forget the season of Advent, which reminds us all of the ‘last things' which we should remember, always and so often do not. Death, Judgement, Hell and Heaven: Advent has come to recall us to our senses, that we should not crowd out these serious facts, which we must face sooner or later, from our lives which tend more and more to be filled with the rush and the noise of everyday living. "Our citizenship is in heaven" says the Apostle St. Paul, and a contemporary of his, the writer of the Epistle to the Hebrews, echoes that in saying, "Here we have no abiding city, but we seek the one which is to come." A Christian is a man of two worlds, not just of one - he is forever. And so let us prepare not just materially but spiritually for the coming of Him who came into our world first at Christmas and who will come again and will fulfill the longings and the aspirations of all who are His and who live in expectation of his coming again in glory. I wish you all a happy and blessed Christmas. 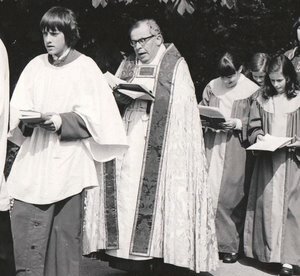 July 1980 - Rev. Herbert Langford's last letter for Focal Point. It had to come some time: this is my farewell letter to you at the end of seventeen years here. To review what I have done here would be an impertinence; to expand on what I wanted to achieve would be arrogance: so, I want to thank Our Lord for what he has allowed me to do among you, with you, and for you; and I want to couple that with an enormous amount of gratitude for what we have been allowed to do together. I was so overwhelmed with your presentation to me at the end of the lovely Centenary Thanksgiving Evensong that I literally could not say more than "Thank you." I now want to tell you how much I appreciate your gifts: the quite outstanding framed picture of the three churches will hang opposite my desk in my home in Durham, as a constant re minder of events happy and sad which I have been privileged to share with you, and of your never failing friendship which found special expression in the way you rallied round me and helped me when my dear Mollie died nearly five years ago. The very welcome cheque covers the major part of the purchase of two ‘household fixtures' (that will keep you guessing until I show them to you when you come to see me in the North): they will be used almost every day and will remind me of you - as if I could ever forget you. I know I shall leave with your prayers, as you may be sure of mine. My new address is: 26, The Orchard, Pity Me, Durham, DH1 5DA. I trust you will have a new Rector soon. If you are as good to him as you have been to me, things should look well for Winthorpe, Langford and Holme. A cantor is a church singing leader. A Gymnasium is a school that prepares pupils for university entrance. Sadly, Rev. Herbert Langford's parents were never able to leave Germany as they lost their lives, 1941-42, in one of Hitler's concentration camps. By a coincidence the name Langford, that he chose to use, was to be the same as one of the villages that he was to serve. I am unable to find out why he chose the name Langford. Could that name be similar to Lampel, the name he was born with? Who knows? He wrote 78 articles for Focal Point, never missing an edition. Rev. Herbert Langford used the Irish spelling of Molly (Mollie) in his final letter for Focal Point. The two household fixtures that he purchased when he moved to the village of 'Pity Me' were a new electric cooker and a small dish washer. Rev. Herbert Langford was the last priest to be installed as Rector of the Benefice of All Saints' Church Winthorpe, Langford and Holme. 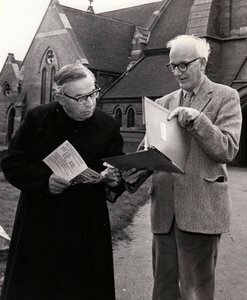 The subsequent two Priests (John Smith and Anthony Shaw) had the dual post of Priest-in Charge and Inspector of Church Schools in the Diocese of Southwell and Nottingham. It was a privilege to have worked as Church Warden with a man of such great Faith who with his own family had been through so much leading up to and during WW2.